Dr Moises Cohen from Elvi Wines a superb winery producing some of Spain’s top award winning wines..
All in all, between fantastic wines and celebrated winemakers, between top restaurants and incredible delicious foods, February the 13th was an evening to remember! This evening, February the 22nd, at 8:00pm (Eastern Time) we will host Ari White on our internet radio show. Ari runs (together with his wife Gemma) Got Cholent? Inc/Gemstone Catering. Ari started Got Cholent? 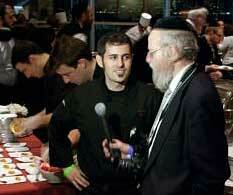 Inc., a few years ago, because he was fascinated with the variations of cholent around the world. Whether you want a standard Ashkenazi cholent, like mama used to make or you prefer the Moroccan Dafina, or a Texas, Asian or other versions, Ari’s company offers them all with more than 12 finger-licking choices. 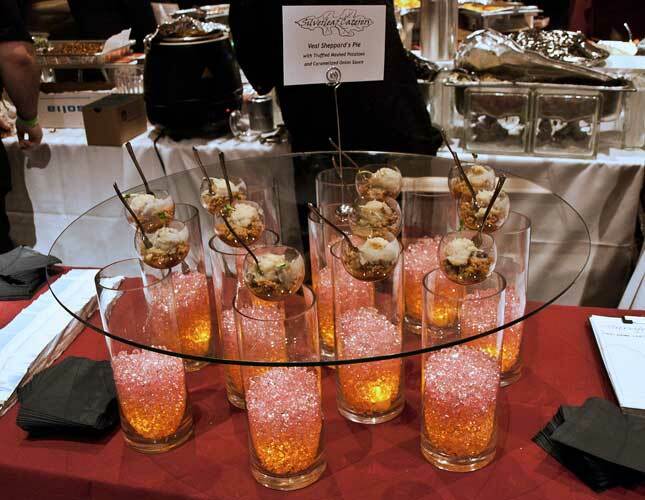 At last year’s KFWE he debuted Gemstone Catering (Gemstone? In honor of his wife Gemma, of course!). Presentation and unusual combination of flavors makes these two companies stand out from the crowd, their imagination and creativity has elevated their food into art. Tonight Ari White will tell us what/who inspires him, what he’s done and where he’s going next. Meanwhile in case you missed it, last week we did two internet radio shows, on Wednesday we did the first part of our interviews with winemakers from around the world, company executives and attendees and on Thursday we featured the second part. Why don’t you give us a listen, you’ll hear how the quest for a perfect kosher wine transformed the lives of winemaker, winery owners and just how often their life journey took them to unexpected, and originally unwanted harbors that turned out to be far warmer and welcoming than they could have believed. Why not tune us in this evening at BlogTalkRadio.com/kosherscene? We will be talking to Ari White from Got Cholent? Inc/Gemstone Catering at 8:00 pm (Eastern Time). Like fraternal twins, one can no longer give the latest buzz in kosher wine without speaking of the distinctive elegant array of kosher foods to pair it with. CS has already shared with you the fabulous wine selections we had sampled at the show. The culinary offerings were no less remarkable, I loved the amenity of table hopping proximity sampling bite sized servings of some of the most exclusive culinary offerings out there in the greater NY area. 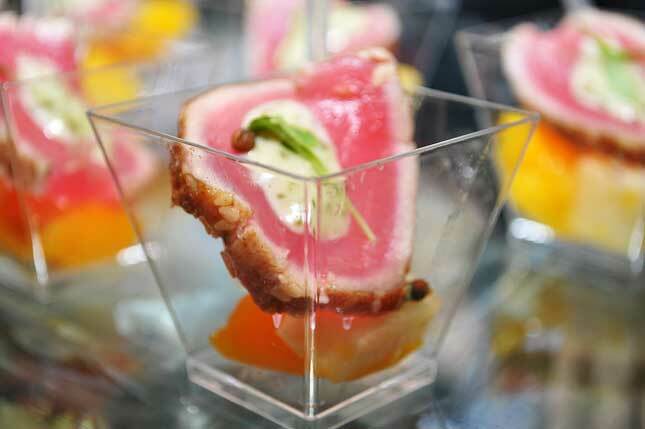 Top tier restaurants caterers and food producers showed off their best gourmet delights. Here are some highlights. 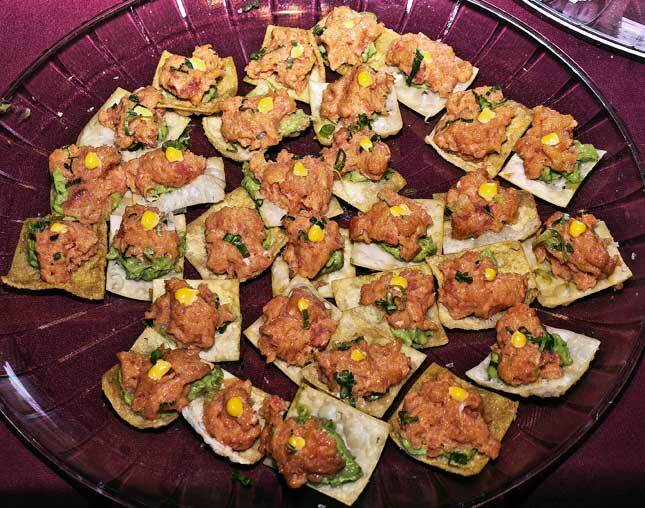 My all time favorite in the fish category was far and away Gemstone Catering’s Ahi Poke– a hawaiin street style Ahi tuna sashimi served on a sesame wasabi crispy wonton shaped like a spoon topped with ginger & lemongrass foam. It was the perfect mouthful of harmoniously matched flavors. I would pair that with Herzog‘s Reserve Chardonnay 2009. Honorable mention goes to Sushein for their delicious sushi offerings. River Dale from Pomegranate Supermarket, gave Geila Hocherman (Kosher Revolution) a taste of their prosciutto and she told me it was almost as good as her own duck prosciutto, I sampled their Butcher Block Honey Mustard Corned Beef and it was melt in your mouth scrumptious. etc’s steakhouse‘s Barbeque Oxtail coated with etc’s own barbeque sauce served with crushed red mashed potatoes was incredible and it looked like attendees couldn’t get enough of it. 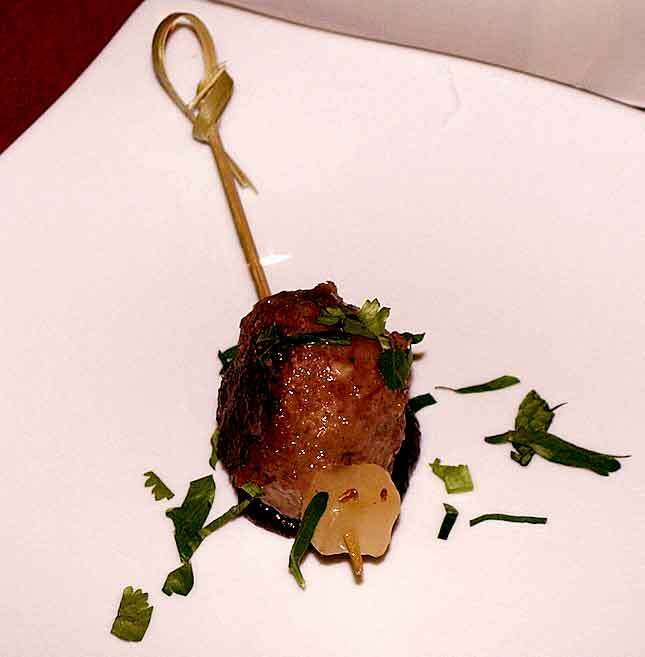 Pardes served a smoked organically grown appetizer with meat from ‘Grow and Behold’ – Smoked Ribeye Tartare, Soy Enoki & Rice Krispies that was quite tasty. Tevere is tevere as always incredible, and though I had no room left I had to go back for seconds of their artichokes – Carciofi alla Giudia, I would pair it with Herzog‘s Late Harvest Chenin Blanc 2010. 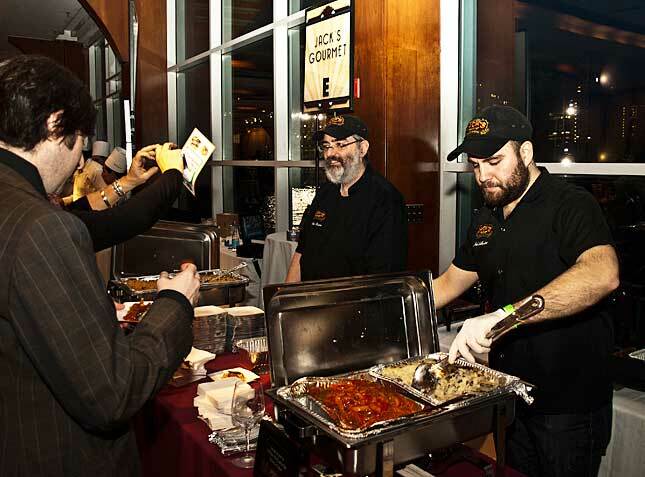 Jack’s Gourmet served me their Sweet Italian Sausage with olive oil, smashed potatoes and pepper and onion ragout. CS, tells me our videographer insisted on a 5 minute break to devour a few sets of their sausages! 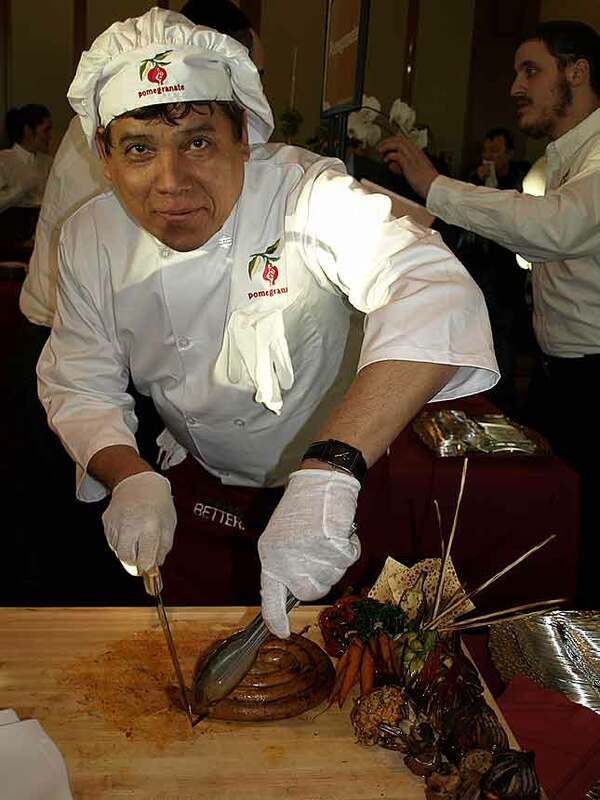 Silverleaf Caterers had a very nice Veal Shepard’s Pie which we followed with their Tiramisyu Cake-Up. I was now ready for dessert, Basil‘s table was manned by our good friend Chef Udi Ezra (the restaurant’s Pastry Chef), he was serving a chocolate truffle pastry and introduced me to Guilty Pleasures, a few tables away. Their Very Strawberry, was just that verrrry strawbery! I loved the Bana-Bana, the Cappuccino Truffle and Toasted Almond Crunch I could see it all paired with some of Binyamina’s Liqueurs like the Limoncello, or the Sour Apple, my favorite, or perhaps the Amaretto. CS interviewed Maureen Sussanah owner/confectioner of Guilty Pleasures on last evening’s internet radio special. All in all it was a great show with superb wines, succulent food, and lots of friends!